Calling all lemon lovers!!! 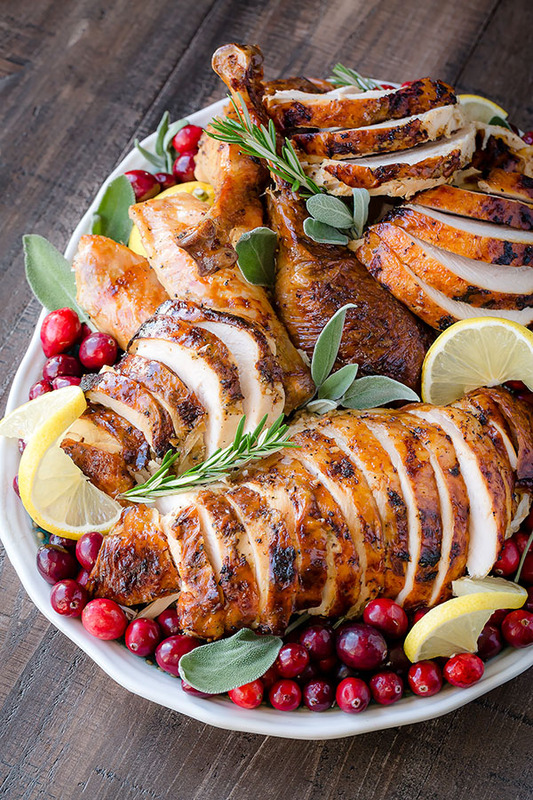 This lemon herb roast turkey is for you! 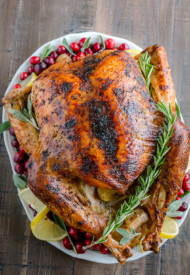 Infused with tangy lemon butter inside and rubbed with mixture of lemon pepper, garlic & herb seasonings and lemon zest, this roast turkey will surprise your taste buds (in a pleasant way!) this Thanksgiving. My goodness, Thanksgiving snuck up on me this year! I was planning to share this recipe with you next week, but then I realized Thanksgiving is next week!!! Whaat?! This whole year went by in a blink of an eye. I shared on Instagram stories yesterday that I still have last year’s Thanksgiving greeting up in my kitchen with our announcement of our pregnancy. 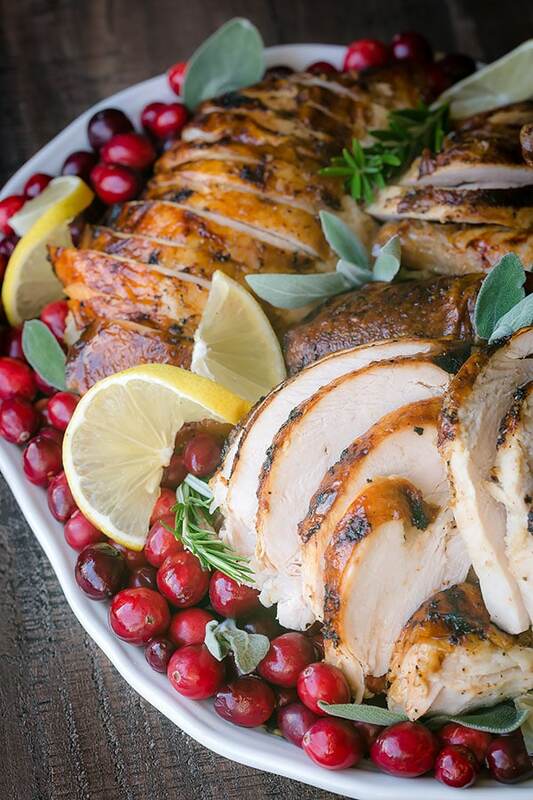 Because this deliciously tangy juicy lemon herb turkey is worth a try! My last year’s juicy no-brine roast turkey with champagne was a huge hit with many of you! And that tells me 2 things: 1. you love a good tang, and 2. you’re happy to skip the brining! Who needs brining the turkey, when you can infuse the meat with butter! And in today’s case, it’s lemon juice + butter!!! 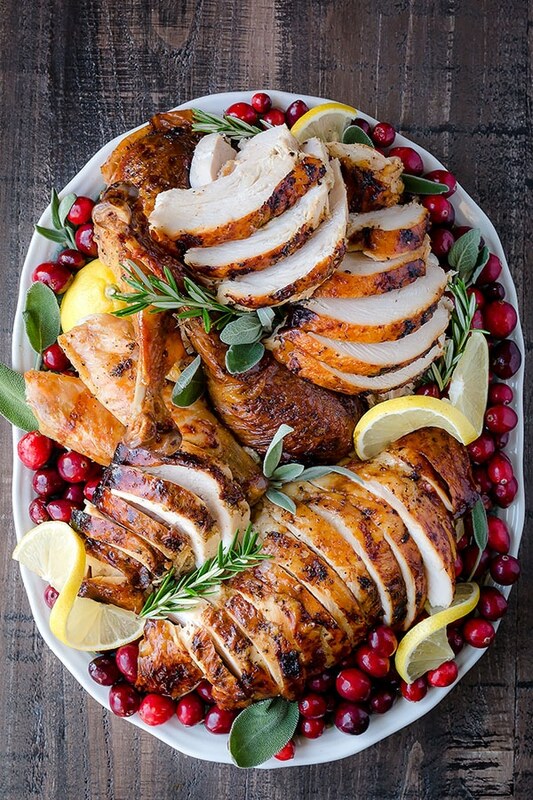 Juicy turkey guaranteed, and plus more fabulous flavor! Grab your marinade injector now and let’s get to work. Yeah, I can’t say enough good things about this turkey! Love the zesty bright lemon flavors in every bite, along with aromatic herbs infused throughout the juicy meat. If you love lemon, I know you’ll love this turkey as well. Love the zesty bright lemon flavors in every bite, along with aromatic herbs infused throughout the juicy meat. 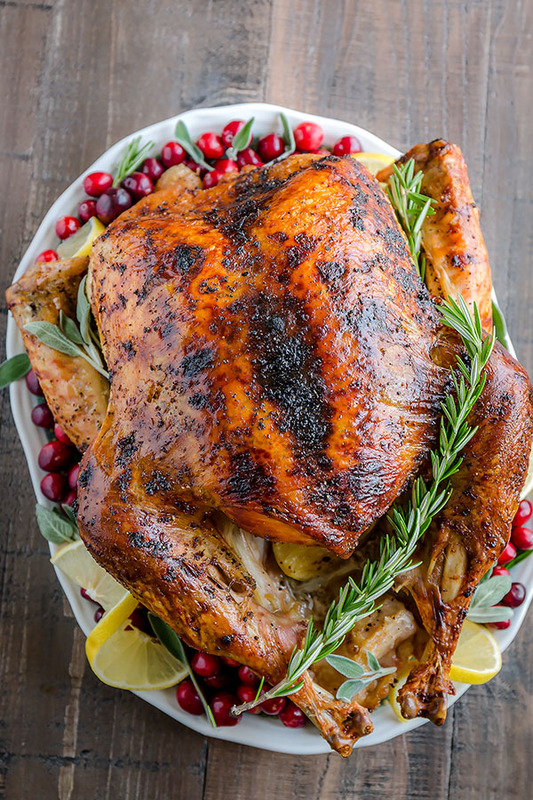 If you love lemon, this lemon herb turkey is for you! Begin to thaw the turkey in the refrigerator 2-3 days before roasting. Pull the neck and giblets out of the cavity. Wash and dry the turkey with paper towels. Carefully run your hand under the breast skin to create a pocket. Cut one lemon into quarters and put it in the cavity. In a small bowl, mix together 2 tablespoons of lemon juice, lemon zest, olive oil, salt and seasonings. Smear the oil and seasoning mixture evenly all over the turkey and under the breast skin. Place the turkey, breast side up, on a V rack in a large roasting pan. In a small bowl, combine melted butter and remaining 2-3 tablespoons of lemon juice. 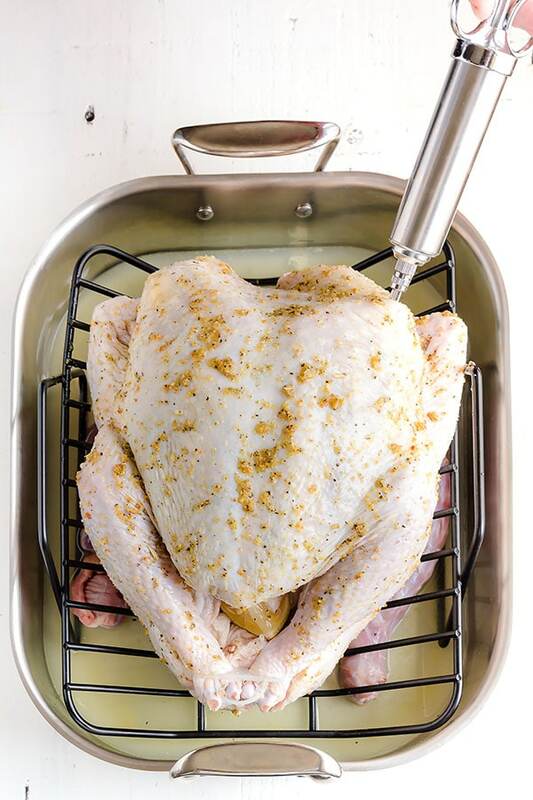 Using a marinade injector, slowly inject each thigh and breast halves with about 1.5 tablespoons of melted butter/lemon juice mixture. Place the chicken neck and giblets in the bottom of roasting pan and pour in chicken stock. The turkey is cooked, when the deepest part of breast and legs registers 165°F (74°C) on an instant-read thermometer. Remove the turkey from oven, cover with foil and let rest at least 30 minutes before carving. Reserve pan juices to make gravy. I got about 3 cups of liquid and used the whole thing for gravy without additional chicken stock. Note 1: I used 14lbs turkey. The cooking time will vary depending on your turkey size. Rule of thumb: estimate 15 minutes per pound.